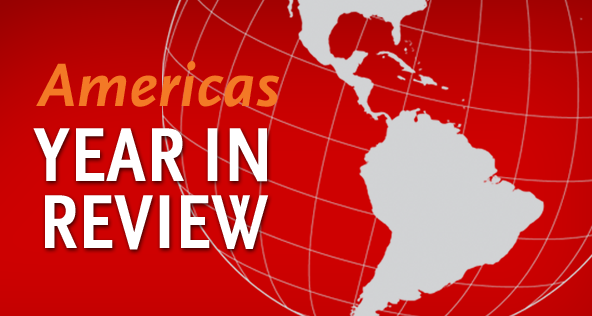 While U.S. election results may feel like they overshadowed the rest of the year, Latin America experienced its fair share of momentous events in 2016. Brazil, whose officials are swamped with corruption and criminal charges, impeached its first woman president within a month of being the first South American country to host the Olympics. Cuba hosted a sitting U.S. president for the first time in 88 years and witnessed the death of Fidel Castro. Colombians narrowly voted against a peace deal to end more than five decades of civil conflict. AS/COA Online takes a look at these and other major events across the region, and how they could affect what’s to come in 2017. In Argentina, President Mauricio Macri finished his first year in office with notable achievements but ongoing economic woes. Though Macri campaigned on the promise of stabilizing the economy, he indicated there would be an initial downturn marked by high inflation resulting from adjustments like lifting currency controls and reforming the national statistics agency so that it reports accurate figures. Thus, the economy is expected to contract almost 2 percent in 2016 before rebounding next year. But by the end of his first 100 days in office, Macri managed to reintroduce Argentina to the international bond market for the first time in 15 years by settling long-standing debt disputes. As of April, the country had already secured $50 billion in foreign investments. Still more needs to be done to tackle the country’s large fiscal deficit in order to inspire more confidence in international investors. Officials highlight the country’s energy sector, particularly the Vaca Muerta shale gas basin, as an opportunity to drive economic growth. Macri’s administration has also dedicated time to politicking, working across party lines to build consensus among various political factions. This strategy will prove important ahead of the 2017 legislative elections, where Macri’s Let’s Change coalition needs to gain support or risk a united opposition that could obstruct his policies. 2016 was supposed to be a year to celebrate Brazil’s decade of economic development and social inclusion as host of the largest global event: the Olympics. Instead, it was a year of economic, public health, and political crises. Brazilians’ fight against systemic corruption began in 2015 and continued this year with the Lava Jato investigations, engulfing the highest levels of government, as well as the country’s largest construction firms. In a scenario in which 299 of Brazil’s 513 legislators in the Chamber of Deputies face criminal charges and corruption allegations taint all of Brazil’s major political parties, the divisive political crisis came to a head over the summer with the impeachment of Dilma Rousseff. The country's first female president was ousted on charges of manipulating government accounts to cover up budget deficits, a violation of Brazil’s Fiscal Responsibility Law. Eduardo Cunha, the head of the Chamber, was also ousted from his post and imprisoned for his involvement in bribes from a company seeking contracts with Petrobras, the state oil giant. This dramatic turn of events took place amid the country’s worst economic crisis in decades, as GDP shrank nearly 4 percent in 2016 and unemployment surpassed 11 percent—a difficult problem for Latin America’s largest market. At AS/COA’s Latin American Cities Conference in São Paulo, International Monetary Fund Executive Director Otaviano Canuto said that beyond being a closed economy, Brazil’s industry suffers from low productivity. He believes the scandals in the midst of the recession could lead to a new way of doing business in Brazil. “We will no longer have the kind of rigged process that we had until recently,” he said in an episode of AS/COA Online’s Latin America in Focus podcast series. In the meantime, President Michel Temer’s new government must address structural economic problems, such as unpopular austerity measures, a federal budget deficit, and insolvency in states such as Rio de Janeiro. In fact, the Summer Olympics took place in the shadow of a federal bailout of the state, security concerns, and the outbreak of the Zika virus. While the Temer administration has worked to project stability to attract investments, Brazilians showed continued discontent with the political status quo, leading to wins by political outsiders during the fall’s local elections. 2016 ends with Brazil facing political uncertainty, given that Lava Jato plea bargains have implicated not only Temer but also dozens of ministers and legislators. As Brazil prepares for general elections in 2018, “the algorithm that governs policy has changed,” wrote former President Fernando Henrique Cardoso in Americas Quarterly. Much of the news coming from Central America in 2016 revolved around violence and increased migration to the United States, particularly in the region’s Northern Triangle—El Salvador, Guatemala, and Honduras. High homicide rates, gang violence, and unemployment affect daily life in the region’s poor areas, generating comparisons to the violence of the civil wars in the 1980s. But there have also been areas of improvement, including, as Richard Lapper wrote in Americas Quarterly, a “newfound pluralism in the region,” and opportunities for economic growth such as Honduras’ burgeoning manufacturing industry. Climate change continues to be an obstacle to economic progress in Central America. The region faced its worst drought in 30 years, which left 3.5 million people in the Northern Triange in need of food assistance. Climate change is also taking its toll on the region’s coffee industry. In Nicaragua, coffee accounts for some 17 percent of exports, and yet the region is on a path to lose the majority of its coffee-growing zone by 2050. The June inauguration of the Panama Canal expansion, a $5.3-billion project launched in 2007, marked positive business news from the region. The expansion involved adding a third lane, doubling the capacity for container traffic, and allowing ships to carry nearly three times as much cargo. In Colombia, voters stunned observers and pollsters on October 2, when they rejected a historic peace deal signed by the government and the Revolutionary Armed Forces of Colombia (FARC) to end 52 years’ of armed internal conflict. With turnout just 37 percent nationwide, the No vote eked out a win by a margin of less than half a percent, or just under 54,000 votes out of nearly 13 million cast. To wit, turnout in departments that voted No on the deal was 10 points higher than in those that voted Yes, 41 to 31 percent. After regrouping with negotiators in Havana, the government did succeed in passing a revised version of the deal on November 30, this time through Congress. The new deal faces a more complicated legal scenario than the original, but it got a boost on December 13 when the country’s Constitutional Court approved fast-track status for its implementation. The fast-track status is crucial to warding off delays—especially in protections for demobilized guerrillas—that could doom post-conflict efforts if significant factions of the FARC’s 7,000-strong ranks decline to disarm and instead turn to drug trafficking. How many FARC rebels disarm will be 2017’s first big test for Colombia. Meanwhile, “No” campaign leader ex-President Álvaro Uribe and his Democratic Center party have a more straightforward task in the coming months: keep up resistance to the revised peace deal, if possible, all the way until 2018, when Colombia holds its next presidential elections. Beyond that, the president must pass tax reform laws before the end of the year and diversify the government’s revenue streams after the drop in oil prices led to $20 billion in lost export revenues in one year, worth 5 percent of GDP. If he doesn’t and the country fails to generate more income, ratings agencies have warned they could downgrade the Andean nation in the coming year. 2016 was another year of historic moments for Cuba. For the first time in 88 years, a sitting U.S. president visited the island, paving the way to make the “new normal” between the countries difficult to reverse. After U.S. President Barack Obama’s March trip, a Carnival Cruise ship made history when it docked in Havana in May. * The 700 Americans aboard the ship were a small part of a wave of visitors—projected to reach 3.7 million tourists in 2016. Add to the mix U.S. commercial flights that began in September and Cuba’s infrastructure is feeling the burn while the restaurant business booms. Yet, as Americans flock to the island, thousands of Cubans are heading north, making the perilous journey through Central America. From October 2015 to July 2016, 46,635 Cubans entered the United States, marking the largest exodus since the 1980s. One reason is fear that the U.S. “wet foot, dry foot” policy will be repealed, and the other is Cuba’s deteriorating economy, made worse by the drop in Venezuelan oil shipments, which supply a majority of the country’s energy needs. Then came November 25: Fidel Castro died. His brother Raúl has been at the helm of the Cuban government since 2006, but by 2018, no Castro brother will be in power. Between now and then, soon-to-be-U.S. President Donald Trump will determine the next steps in the U.S.-Cuba relationship. Settling U.S. property claims could be a win-win for both countries, argues Cuba expert Richard Feinberg, while undoing the Obama policy would hurt Cuba’s emerging entrepreneurial class, which number somewhere around 500,000. The new U.S. administration’s policy remains to be seen, but for Cuban officials, lifting the U.S. embargo is still a must before having completely normal relations. After a year of postponing a runoff election and ultimately scrapping the first round of the 2015 results, Haiti was hit by a Category 4 hurricane that killed more than a thousand Haitians days before they were scheduled to vote. In the first part of the year, the country rescheduled the presidential runoff between the former President Michel Martelly’s pick, Jovenel Moïse, and opponent Jude Célestin twice, moving the original runoff date from December 27, 2015 to January 24, 2016, and then again to April 24, later postponing it indefinitely. By February 7, Martelly was constitutionally mandated to step down, and a provisional government under Jocelerme Privert took the reins. In June, Haiti’s Provisional Electoral Council (CEP) decided to start elections from scratch after a report found 40 percent of the October 2015 votes were unverifiable. The CEP set new general elections for president and a third of the Senate for October 9—nearly a full year after the initial, scrapped elections were held. But then came Hurricane Matthew on October 4, and elections were once again pushed back—this time to November 20. Even though scores of polling centers had been destroyed and voter IDs lost in the rubble, 21 percent of Haitians turned out to vote, electing Moïse with over 50 percent of the vote, and as such avoiding the need for a runoff. He takes office February 7, 2017. Corruption emerged as a defining issue in Mexico, demonstrated by a citizen-backed initiative called Ley 3de3 aimed at holding officials accountable through public declarations of personal assets, possible conflicts of interests, and taxes. The legislation received more than five times the number of voter signatures necessary for legislative debate, although it ended up getting watered down by Congress over the summer. Still, Mexicans showed their dissatisfaction at the ballot box in July’s elections, when the governing Institutional Revolutionary Party (PRI) lost six of the nine governorships it held going into the vote. The results were widely seen as a rebuke over impunity, given that 98 percent of the country’s corruption-related crimes go unpunished. The PRI got the message, replacing its party chief and initiating steps to remove corrupt, outgoing governors from its ranks. It remains unclear what all this means for the country’s 2018 presidential vote, but changing demographics could result in shifts in the country’s party-dominated politics over the long run. Millennials have the potential to make up half the electorate in the 2018 vote and a new study shows they’re less loyal to parties than older voters. In keeping with corruption frustrations, they value honesty over other traits in their next president. But, regardless of domestic politics, the U.S. election arguably defined Mexico’s place in the 2016 global news cycle, given President-elect Donald Trump’s campaign pledges to build a border wall, deport millions of immigrants, and pull out of the North American Free Trade Agreement (NAFTA). The peso took a beating ahead of and after Trump’s November 8 win, and Mexican immigrants are expected to send home a record $26.8 billion in 2016 out of fear that the new U.S. president will impose restrictions on remittances. Trying to stifle bilateral ties won’t be so easy, though. The two countries trade $1.45 billion daily, 35 million Mexicans and people of Mexican descent live in the United States, and Americans travel more to Mexico than any other foreign country. There are already cracks in Trump’s plan to build a wall across the entire border, thanks to numerous physical and legal barriers. And while the president-elect calls for a renegotiation of NAFTA, Mexico is saying it’s instead open to a modernization of the trade deal. If Trump does make good on pledges to restrict trade, Mexico—and other Latin American countries—may well look to China to fill the gap. Peru used to have a particular political tradition: in the last three presidential elections, voters elected the candidate who’d been the runner up in the previous election. In 2016, that made Keiko Fujimori the heir apparent, given that the eldest daughter of former president Alberto Fujimori lost the 2011 runoff to Ollanta Humala. Keiko won the first round of voting handily after a tumultuous campaign season that saw numerous candidates removed from the race by the country’s electoral board—including the popular Julio Guzmán, who was disqualified over misfiled paperwork. In the runoff, Fujimori faced Pedro Pablo Kuczynski, known as PPK, a former banker and minister who finished third in the 2011 race. In the end, though, the sins of her father—who now sits in a Peruvian jail for abuses of power—proved too much for her to shake, and she lost the second-round vote by less than 0.25 percent. Since taking office in July, PPK set an ambitious, pragmatic agenda, filling his cabinet with like-minded technocrats; pursuing a deeper leadership role for Peru in the region; bridging the gap with the fujimorista-controlled Congress; and working to boost the formal economy, expand access to potable water, and strengthen anti-gender violence laws. 2016 was the year Venezuela somehow did not fall apart completely. But the center is not holding. The country officially hit hyperinflation in December, and food shortages have become so severe that some areas of the country are bordering on famine. The year was dominated by an institutional tug-of-war weighted heavily against the opposition. In January, the opposition took over the legislature after a rout of chavistas in the December 2015 legislative elections. The opposition coalition, known as the Democratic Unity Table (MUD), was supposed to have a two-thirds supermajority in the unicameral National Assembly, which would have served as an important check on President Nicolás Maduro’s administration. But the Supreme Court and the National Electoral Commission (CNE), two branches of power that have not ruled against executive interests in over a decade, frustrated their every step, from announcing certain legislators were disqualified to declaring the entire legislature in contempt of court. In October, after months of delays, the CNE shut down the last card in the opposition’s hand: a recall referendum of Maduro. The first date on Venezuela’s 2017 political calendar is January 10, the date after which any recall of Maduro would result in him ceding the presidency to his executive vice president rather than requiring elections. But the chances the CNE will allow the recall before then are slim and, in light of that, the opposition is left with civil disobedience and international pressure as their last best strategies. MUD’s primary task in 2017 will be for its various factions to unite around one cohesive plan that can corral anti-Maduro popular sentiment and push for the release of political prisoners like Leopoldo López, who’ll hit three years in detention come February. One wild card is the Venezuelan military, whose upper echelons are closely tied to power brokers in the Maduro administration, but whose lower ranks face mounting strains. The Maduro administration, meanwhile, is betting that the price of oil—which makes up 96 percent of export revenues—will go up and, with its depleted coffers restored, Venezuela and the state oil firm PDVSA can avoid default and hold on to power. His government received good news on November 30, when OPEC decided to limit production for the first time in eight years. Editor’s note: This report initially stated that President Obama traveled to Cuba in April 2016. His trip was in March 2016. Venezuelans abroad are channeling their coding skills to help their country.